Please note: If you have any concern over your horse’s health please talk to your veterinarian in the first instance. This article is designed for education purposes rather than attempting to diagnose illnesses or prescribe treatment protocols. 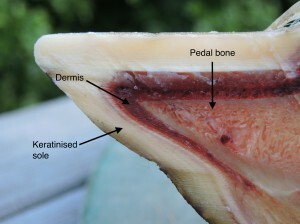 A hoof abscess (pododermatitis purulenta) is a, usually, localised pus filled (purulent) infection that forms between the dermis and the epidermis of the hoof (the squidgy bit and the hard horn), a scientific definition would be a purulent dermal inflammation of the podotrochlear apparatus. Why did my horse get an abscess? An abscess needs two things to form, bacteria and a blood supply. 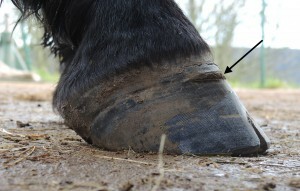 The bacteria will enter the hoof capsule either through a weakness, such as stretched white line or seedy toe, or through injection following a puncture wound. The blood comes from the damaged (bruised/leaky walls) blood supply of the dermis, usually either of the wall or the sole. Once the bacteria has met the blood supply, the body will detect the invasion of the foreign matter and will activate it’s defence mechanisms – specific types of white blood cells called lymphocytes multiply and produce antibodies to fight the infection, this is a standard immune response and is the reason for the white pus in spots and abscesses. The structure of the hoof – Because the hoof is mainly hard horn rather than soft tissue, any increase in pressure from multiplying lymphocytes is going to cause pain, this makes us want (and need from a welfare point of view) to reduce the pain as quickly as possible. The way hooves grow – Sole and hoof wall are hard horn structures, that grow from soft fleshy structures – this happens by a process of keratinisation. As new cells form at the dermis, they push slightly older cells towards the surface, these cells change shape as they are pushed outwards and gradually thin and flatten. This process is the same for all epithelial (skin) cells in all animals, where the hoof differs is that as the cells flatten, they also harden (keratinise) to form the horn that we see on the outside. This is the key difference with hoof abscesses to other skin abscesses, because the keratinising cells form a pocket around the infection and within a short period of time, seal it off from the blood supply of the dermis – effectively preventing any further antibodies from reaching the infection, but also preventing the infection from penetrating further into the body*. So, we have large amounts of pressure building up, but we also have a self limiting system that is sealed off from the rest of the body. If we can encourage weight bearing and natural, unforced movement on the affected foot (i.e. 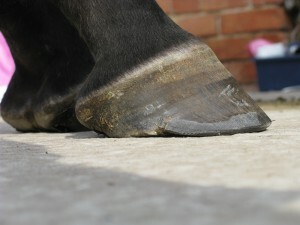 out in the paddock grazing, or in an enclosed yard), the abscess will behave much like a worked spot on a teenager’s face, it will follow the lines of least resistance and make its way out of the hoof, usually at the coronary band, either above the hoof wall, or at the heel bulbs, occasionally it will pop out under a bar or in one of the collateral grooves. Typical abscess burst hole growing out (shown by arrow). 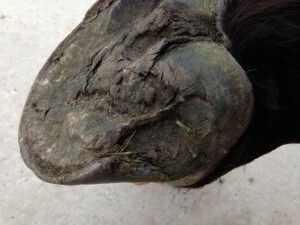 It does this because of the layer structure of the hoof, it is easier to move along the sole or up through the laminae than it is to work it’s way down towards the ground at the whiteline. The flexion of the hoof capsule at every step also helps this. The great thing about nature’s way of dealing with the abscess is that the hoof seals itself behind the moving abscess via the keratinisation process, so the dermis is not at risk of infection when the abscess bursts out. The key here though is reducing pain and encouraging movement. Some vets will provide NSAIDS for a suspected abscess while others will want to intervene and instigate drainage at the first opportunity, as this generally provides instant pain relief, but may have complications (see below). Some of the herbal remedies available in tack and feed shops that contain Boswellia or Devil’s claw can be very helpful in improving comfort, the key thing is that it is important from a welfare point of view not to leave the horse hobbling around in pain. 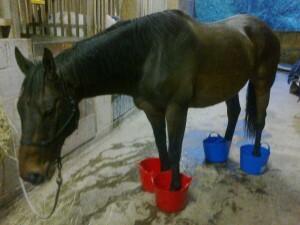 Many people recommend “hot tubbing” (soaking the foot in a bath of warm water with epsom salts) to soften the hoof and “draw” the abscess. Poulticing the foot is also common for the same purpose. I’m not sure whether any studies have been done showing the efficacy of either intervention, but both make us feel better, and hot tubbing followed by hot poulticing may encourage the abscess to “brew” which will increase the pressure and encourage mobilisation of the abscess through the foot. The tubbing process does seem to be soothing, many horses that react to tubbing on the first occasion seem to be looking forward to it on day 2 and 3, so is useful from that point of view. The poultice also provides cushioning from the ground so may be more comfortable, especially if the foot is then protected with a hoof boot, the poultice is also useful to catch anything comes out from around the frog and bars if the abscess doesn’t burst at the coronary band. In a barefoot horse, with adequate pain relief and good mobility (not on box rest), you can expect to see an abscess exit hole in 3-5 days, though some seem to rumble on for up to a week or more. One is where drainage is established too quickly, before the dermis has had a chance to seal itself from the infection, this can lead to recurrent infections over a period of several weeks, or months if you are really unfortunate. Another problem is when the internal structures of the hoof are already damaged, such as in a case of laminitis or pedalosteitis, and the dermis is unable to grow new cells fast enough to seal off the abscess. In this case, the infection can track back into the body, leading to filled legs, this is dangerous for the horse and a vet is needed quickly to provide antibiotics to control the infection. The exit hole could be in a location such as the heel area and may lead to a large piece of heel wall snapping off. There are ways of mitigating this though, through the use of prosthetic devices on the hoof (shoe/hoof boot/poultice) which limit leverage and movement of the affected part. However, because of that magic sealing mechanism described earlier, you would have to be very unlucky for the piece of wall falling off leading to further infection. While it is unusual, sometimes isn’t an abscess, but something else wrong with the foot – septic pedalosteitis, keratoma, canker, quittor, fractured pedal bone, penetrating wound etc. For this reason, it is important to understand the progression of the lameness and involve your vet if you have any concerns that your lame pony has something other than an abscess. While we are talking about hoof infections, it is worth a quick discussion regarding puncture wounds. Penetration of the hoof by a sharp object is a veterinary emergency! As soon as you find your horse with something stuck in its foot, call the vet. Don’t pull the object out, it is important that the vet can see the object and the direction of the tract it made in order to determine the treatment and prognosis. Instead, find things that will lift the foot and the object clear of the ground – rolls of self adhesive elastic bandage are good for this, cotton wool, blocks of wood – anything you can find that will allow you to leave the object in place until the vet arrives with a portable x-ray machine. Wrap the foot up as best you can, and limit movement of the horse as much as possible, and try to keep calm, it will help your horse to keep calm too. If the worst does happen, and your horse does have a wound that has punctured vital structures within the hoof, careful infection control will be required. There is a brilliant cleaning agent called cleantrax, the active ingredient of which is used in hospitals to deal with bone infections. With the right procedures, and especially when there is a hole in the foot, this agent can penetrate into the hoof and prevent otherwise nasty infections from taking hold, without the need for surgery – talk to your vet about using it rather than other more aggressive products that sometimes get suggested. Cleantrax and a special soaking boot are available from good hoof tool suppliers. 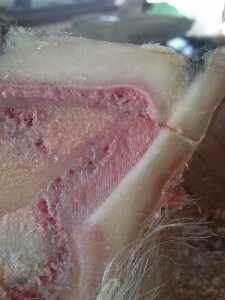 The dermis of the hoof (the pink fleshy bit that actually does the growing) is in the same place in every hoof – next to the bone (and digital cushion to grow the frog). As an abscess needs both bacteria and a blood supply to form, it stands to reason that an abscess can only form next to the dermis, and therefore deep within the protective hard wall/sole of the foot. When a vet refers to an abscess as deep, vs shallow, they can only be commenting on the thickness of the hard sole of the horse and how far they had to drill/dig/poke (insert relevant word) to find the pus. All hoof abscesses, by the very nature of the hoof are deep.